After collecting feedback from you on your needs and delving into usage statistics, library faculty made difficult decisions in their final recommendations. Interim Library Dean Keith Ewing reviewed the library faculty recommendations, recommended a few additional cancellations, and approved for cancellation the titles below. None of the decisions were easy. To look at the entire list at once with total dollar amount cut, please click on the link below for the databases, serials (journals), and standing orders (reference titles) that will end in FY 2018. The list is also broken up on this guide by databases, serials, and standing orders. The Collection Management Task Force will provide the end dates of when the library will lose access to these resources as they are confirmed. If you or other faculty have any major questions or concerns, especially for any potential critical affect upon your teaching or student research that cannot be mitigated by the availability of other resources, please describe your concerns in an email to library@stcloudstate.edu. As noted previously, a more detailed evaluation ending in recommendations for additional cuts will occur during Fall semester for cancellations to occur in FY2019. These cuts are are required as a result of both cuts in the University budget allocations and increases in annual subscription rates. If you would like additional information about the subscription rate increases, please contact the above email address. We appreciate your assistance, patience, and support throughout this process. We would not have accomplished as much as we have without your input. My many thanks to the library faculty on the task force and to faculty across campus who participated in the survey and shared their concerns. Serial Advertising Age P 113.00 Remains available w/no delay through ELM (ASP, BSC, CMMC, Gale Cengage) and LexisNexis. Serial American Scientist P 84.00 Remains available with no delay through ELM (ASP, Masterfile). Serial Architectural Record (McGraw Hill) P 76.00 Remains available with no delay through ELM (ASP, BSC, Masterfile). Serial Astronomy P 51.95 Remains available with no delay through ELM (ASP, Masterfile, Gale Cengage). Serial Automotive News P 159.00 Remains available with no delay through ELM (BSC, Masterfile, Gale Cengage). Serial Backpacker P 36.98 Remains available with no delay through ELM (Masterfile, Gale Cengage) and Sportdiscus. Serial Bicycling P 29.98 Remains available with no delay through ELM (Masterfile, Gale Cengage) and Sportdiscus. Serial Booklist P 180.50 Remains available with 14-day delay through ELM (ASP, Masterfile, Gale Cengage). Serial Ceramics Monthly P 62.97 Remains available with no delay through ELM (ASP, Masterfile). Serial Christian Century P 75.00 Remains available with no delay through ELM (ASP, Masterfile, Gale Cengage). Serial Christian Science Monitor (Domestic ed) P 122.00 Remains available with no delay through ELM (ASP, Masterfile). Serial Dollars & Sense P 48.00 Remains available with no delay through ELM (BSC, Masterfile, Gale Cengage). Serial Feminist Teacher O 140.00 Remains available with no delay through Project Muse. Serial Forbes P 62.95 Remains available with no delay through ELM (BSC). Serial Generations, The Journal of the American Society on Aging O 129.00 Remains available with no delay through ELM (ASP and Masterfile). Serial Golf P 26.95 Remains available with no delay through ELM (ASP, Masterfile) and SportDiscuss. Serial Good Housekeeping P 29.97 Remains available with no delay through ELM (ASP, Masterfile). Serial Health P 26.97 Remains available with no delay through ELM (ASP, Masterfile). Serial HRMagazine (VA) P 71.00 Remains available with no delay through ELM (BSC). Serial Journal of Accountancy P 75.00 Remains available with no delay through ELM (BSC, Gale Cengage). Serial Journal of American Culture O 324.00 Remains available with no delay through ELM (ASP). Serial Journal of Applied Meteorology and Climatology O 710.00 Remains available with no delay through ELM (ASP). Serial Journal of Consumer Affairs O 587.00 Remains available with no delay through ELM (ASP, BSC, Gale Cengage). Serial Journal of Criminal Law and Criminology P 65.63 Remains available with no delay through ELM (ASP, Masterfile). Serial Journal of Economic Issues O 207.00 Remains available with no delay through ELM (BSC). Serial Journal of Financial Service Professionals P 130.00 Remains available with no delay through ELM (BSC). Serial Journal of International Marketing O 275.00 Remains available with no delay through ELM (BSC). Serial Journal of Public Policy & Marketing O 154.00 Remains available with no delay through ELM (BSC, Comm&Mass Media). Serial Journal of the Atmospheric Sciences O 990.00 Remains available with no delay through ELM (ASP). Serial Literary Review (NJ) P 47.00 Remains available with no delay through ELM (ASP, Masterfile, Gale Cengage). Serial MacLeans P 70.00 Remains available with no delay through ELM (ASP, BSC, Masterfile, Gale Cengage). Serial Mother Jones P 35.00 Remains available with no delay through ELM (ASP, Masterfile, Gale Cengage). Serial Multilingua O 590.00 Remains available with no delay through ELM (Comm and Mass Media). Serial Natural History P 41.00 Remains available with no delay through ELM (ASP, Masterfile, Gale Cengage). Serial New Internationalist P 54.00 Remains available with no delay through ELM (ASP, Masterfile). Serial New Republic P 82.97 Remains available with no delay through ELM (ASP, BSC, Masterfile). Serial New Yorker P 99.99 Remains available with no delay through ELM (ASP, Masterfile, Gale Cengage). Serial Palaestra O 210.00 Remains available with no delay through ELM (Gale Cengage) and SPORTDiscus. Serial Popular Mechanics P 31.00 Remains available with no delay through ELM (ASP, Masterfile). Serial Progressive P 52.00 Remains available with no delay through ELM (ASP, Masterfile, Gale Cengage). Serial Psychology Today P 30.97 Remains available with no delay through ELM (ASP, Masterfile, Gale Cengage). Serial Reference & User Services Quarterly O 80.00 Remains available with no delay through ELM (ASP, Library Lit, Gale Cengage). Serial Rolling Stone P 39.96 Remains available with no delay through ELM (ASP, Masterfile). Serial School Librarian P 164.38 Remains available with no delay through ELM (Gale Cengage). Serial School Library Journal P 144.99 Remains available with no delay through ELM (ASP, Library Lit, Masterfile, Gale Cengage). Serial Ski P 24.00 Remains available with no delay through ELM (Masterfile) and SportDiscuss. Serial Smithsonian P 46.00 Remains available with no delay through ELM (ASP, Masterfile, Gale Cengage). Serial Sports Illustrated P 88.95 Remains available with no delay through ELM (ASP, Masterfile) and SportDiscus. Serial Time (Domestic edition) P 77.13 Remains available with no delay through ELM (ASP, BSC, Masterfile). Serial Variety P 329.00 Remains available with no delay through ELM (Masterfile, Gale Cengage). Serial Vogue P 33.95 Remains available with no delay through ELM (Gale Cengage). Serial Weather Forecasting O 365.00 Remains available with no delay through ELM (ASP). Serial Woman's Art Journal P 125.00 Remains available with no delay through ELM (Gale Cengage). Serial World Literature Today O 149.00 Remains available with no delay through ELM (ASP, Masterfile, Gale Cengage). 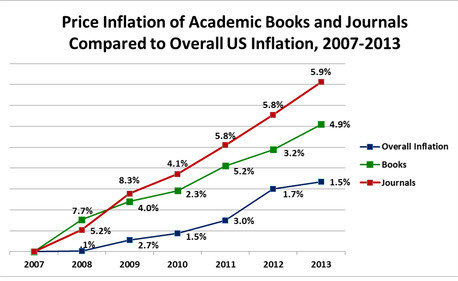 A recent Library Journal article providing more information about the rising cost of journals, as well as the average cost per journal by discipline, may be found here. In FY 2008, serials and databases made up 80% of the SCSU University Library budget. Over time, costs continued to rise, but funds became scarce. 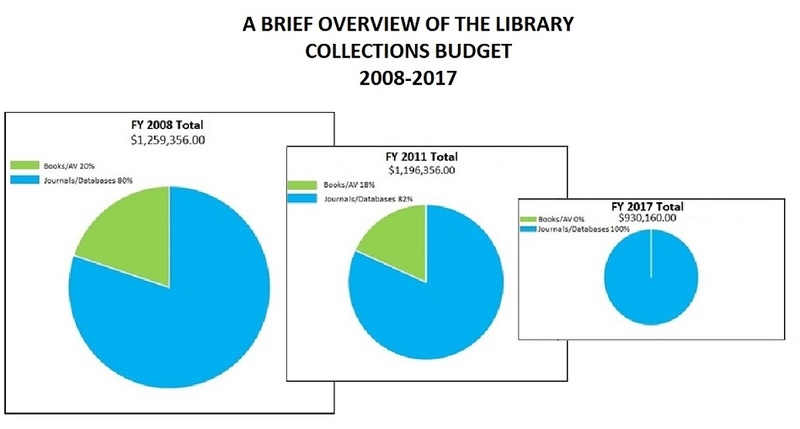 As the Library experienced budget decreases, the collections budget became depleted by ongoing subscriptions for databases and journals, leaving no funds for books or DVDs. The link to the Library Subscriptions Review survey is below. Please consider your answers carefully. The closing date for the survey is Monday, April 3, 2017.